Size – 5.4m x 10.2m with 460mm (18”) overhang along one gable end, this end to have deep barge board. Aperture – Two approx. 1’ arched 4.45m x 2.13m high apertures in one 10.2m gable end. Doors - 7' wide double doors in 9' gable end and one single 834mm wide t & g door along one 5.4m side. 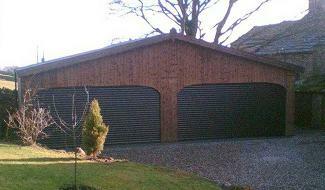 Doors – two hinged double doors 2.4m wide x 1.98m in one gable end. Doors - Two 2.4m x 2.1m (8' wide x 7' high) Henderson “Bergen Chevron” tracked up and over doors constructed from T&G kiln dried Cedarwood.